Have you ever used ‘Kahoot’? I have and think its super dooper! During my last prac, I was introduced to an online program called ‘Kahoot’ (click HERE to visit the main site) by a pre-service teacher from the University of Queensland. At my prac school, each student as per their book list, was required to have a personal iPad that assisted in making Kahoot a success within the classroom. Kahoot is a webpage created for educators (as well as anyone else I guess) in the implementation of creating an online ‘trivia style’ game. In my case I used it in year 9 business studies and year 11BCT as an in class interactive revision game. Prior to the lesson, I created a multiple choice game based around the content the students in each class had learn’t over the unit duration. Kahoot was super easy to use for us teachers. All we needed was a list of set questions, the answer as well as three other possible answer to insert. Once the teacher has completed this, they are issued a ‘game key’ consisting of a four digit pin to play and interact. When the students arrived to class with their iPad’s, they were told to visit THIS special Kahoot page, where they inserted the ‘game pin’ and a username to access my specialised game (please note – only students with the game pin could play the game. The students had 2min to access the game at the same time – during this time, as each student logged in their name – which I had instructed MUST be their first name and the first initial of their surname into the game. As they logged in, their name would appeared on the projected screen from the ‘teachers screen page’ on the kahoot site and where the questions to each question would also appeared further on). Once this had occurred and when I could see every students name in the class appear on the ‘participants’ screen, the game was ready to be played. On each individual student iPad, they could see only the letters a, b, c, and d which correlated with the answers to the multiple choice questions on the screen. As each question appeared on the projected screen, students had one minute to answer the question. After each question a graph showing the percentage of students answering the correct question, as well as the percentage of the incorrect answers showed on screen. This continued on until all questions that the teacher created had been answered. Also at the end of the game, the top three students were shown on the screen – this created a sense of competitiveness between the students, and you could actually see the students really try at the questions. I hope my account was useful! Below is a YouTube clip on how to use Kahoot if my account is not clear. I really recommend watching this video, it will really help you get a better understanding Kahoot as well as its processes and how it can be of value within the classroom. Wix and Assignment one .. eek! Assignment One’s due date is just around the corner! Three words to describe this feeling… eeek, arggghhhh and omg!! Prior to this secondary degree, I dappled in another degree at another university where I had to create a WIX interactive webpage for young children. I was able to pickup the online WIX website builder pretty quickly and was able to create a primary education SOSE lesson interactive game quite quickly. The link to my original creation can be found here: http://sandriolo.wix.com/edp130_webpage#!. I won’t lie, I created this quite a number of years ago and the quality of it is not technologically sound as it would have been if recreated now. Although I am my worst critic, I was pretty happy with the embedding of videos, animation and sound that I had created and thus why I have mentioned it in this post. Due to using WIX prior, I have finally decided (yes, a week out from assignment one due date eeeekkk!) that I would use WIX again for assignment one’s artifact. So far I have discovered that the site has changed from when I last used it, and spent a couple of hours today trying to get my head around new feature. I have finally though been able to create (in my opinion) a really neat homepage for my artifact and ready to continue on with the core information needing to be embedded into it….. FINALLY! My feelings so far on this assignment have been a mixture of confusion mixed with feeling overwhelmed due to numerous ideas for my artifact and wanting to input unnecessary bells and whistle to the webpage which is delaying my progression to the more important features such as the content! I will give you another update in a few days time on how I am progressing with the assignment. So far, the foundation stages such as, choosing the technological platform (WIX Webpage), dot points on what needs to be within the content and a beautified front home page have been constructed. I am hoping in a couple of days time most of the content has been discovered as well as the online resources being embedded have also been sourced. I feel writing this down in my blog has made me more accountable to keep trekking on with this assignment. I now know that my few followers, as well as those who follow me on Feedly, will be able to see this and therefore I feel I ‘owe it to them’ to continue on with my assignment – quite strange, I know – but whatever works, hey! I am off to keep going on my WIX artifact now! Wish me luck! Ps. 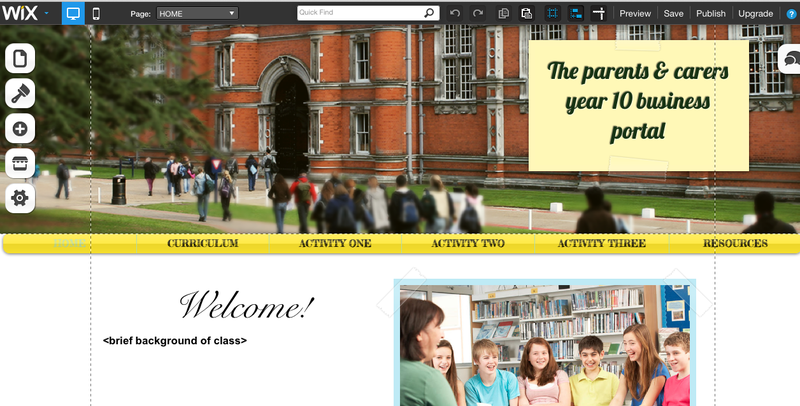 I have inserted (below) the banner of my WIX webpage assignment that I created in the EDC3100 tutorial on Friday. I have inserted it into this post to give you a snapshot on the WIX program and to exemplify its simplicity when creating a webpage through their online program! Sharing is caring should be every teachers motto! One of my favourite places to look online for valuable information (other than Pinterest!!) is Youtube. I also believe it is imperative for the continual progression and professionalism of teachers locate and share resources (those of value of course) with each other in the interest of our core business, that being, to educate, support and differentiate material and resources to our students. After having a read of fellow EDC3100 student blogs, I came across my friend Jesse’s blog post on technology being made ‘real’ on a more international/global scale. Jesse found a video to really reiterate the effects technology has now had on today’s society. This video has been put together in an easy to understand format that not only tickles the interests of those concerned in technology and its effects, but also for those who have no interest in it, but find statistics and knowledge valuable. Great find Jesse! I hope this “blog promotion” as such and links to his really informative blog post and video (although seven years old) has been a value source of information on technology and its continual effects and growth on today’s society! PC Mag: “The social media sisterhood of ISIS” by Chandra Steele (18/03/2015) – very informative article with a lot of background information and supporting video clips. Within these articles, it is evident that social media is not being used for its original intentions anymore and in fact, social media now isn’t as innocent and safe as what parents, teenagers and teachers may seem. The purpose of this blog post was not to scare teacher’s away from using social media within their classrooms – I believe social media has its place, and when used effectively, can be an amazing tool. This post however was created to build awareness of an issue that is currently being circulated within the media and effecting parents, students and teachers alike. You maybe asking yourself, what can we do to prevent terrorists and unwanted content and propaganda being exposed to our students? I know, that’s something I have been asking myself. After some extensive research, I came across the CyberSmart website designed for children, teenagers, parents, teachers and schools to tackle the issue of cyber safety. I have actually sat in on a CyberSmart seminar a few years ago and it was a huge eyeopener. I am a person who thought I knew the in’s and out’s of the internet, however I was quickly awoken to the dark-side of the internet and social media. On this site as well, there is information on the three bodies of education within Queensland, Education Queensland (EQ), Independent Schools Queensland (ISQ) and Queensland Catholic Education Commission (QCEC). Information relating to each body can be found HERE where information relating to cyber safety and policies can be found. Below are some stats to also support the use of social media by our students. It is very interesting to note that the students who we currently teach, have only every known life to have internet and social media within it. Majority of students in 2015 have at least one form of social media platform in that they are signed up to. I also believe students don’t know how to be cyber safe without the guidance from teachers and parents instructing them on how to do so – we cannot just assume they know! Being an administer of education, it should be imperative for teachers to allow students to use technology and social media in a safe manner exemplifying ways that students can use the resource to optimize the learning experience as well as being safe at the same time. One way of teaching students about safety on the internet is exploring a students ‘digital footprint.’ An article written by Educational Technology and Mobile Learning titled ‘A great guide in teaching students about digital footprint’ is a great start for teachers to educate students on building a safe and positive presence online. Another way is to educate students on being tracked online. This article, written by Jackson Chung titled, ‘You’re being watched online’ is another great tool along with an informative image (as seen below) to assist in also teaching students about how their internet ‘movements’ can be traced online. Finally, there needs to be a cooperative alliance between teachers and parents when tacking cyber safety. Although teacher’s have a responsibility to inform and to educate students on social media, being cyber smart and skills relating to the use of technology in a safe manner, it is also the responsibility for parents to enforce and engage with their students at home on being cyber safe. A really informative clip below was created for parents to understand the extent of the internet and social media today and how to become more aware and knowledgeable. Without a team approach of teachers and parents, students will have free range access of the internet, potentially putting them in harms way. By accessing and utilizing the resources above, parents and teachers can be more informed and help build and maintain a safe online environment for their students. The past three weeks of semester one have been…… I don’t even have one word for what it’s been like.. sooo.. here are a couple: crazy, exhausting, busy, erratic, overwhelming and completely consuming of my life – more than any other semester has ever before. For the past few days, the procrastination has been at an all time high and took the past few days from posting on my blog as well as going through the weeks learning path. The problem with this ‘plan of attack’ is now I am feeling more behind and stressed – although I’m not really behind in reality! Today, Wednesday the 18 March 2015 I declare to be ‘taking control’ day. No more days off and no more stress! I am in the midst of finishing this post and have been working with ideas on my next post slowly over the past few days! Now that’s taking control! iPad’s as the teacher’s pet (click HERE to view this page) – This site is great! I have worked in a 1:1 Ipad school previously when I was on professional experience and loved how the iPad’s were integrated within the classroom. Before this experience I was very skeptical on the uses and whether or not iPad’s would be seen as a distraction rather than a tool. I myself saw it as a tool that both worked well for the teacher who administered quality lessons alongside the technology as well as for the student who was engaged fully with the content and technology. This webpage is great for both teachers who have and have not used an iPad in the classroom before to give ideas on how to use them efficiently as quality teaching tools. Blake’s blog also goes into a number of different technologies along with the iPad that teachers may find useful – it is a really good read into the variations of ICTs that can actually be used in the classroom! Youtube for Schools (click HERE to view this page) – YouTube has been around online for as long as I know. Not only does YouTube cater for videos of various things from entertainment, to tutorials to informative, but it can also be an amazing resource for in the classroom). YouTube for schools is a page based upon ways in which YouTube can be utilized as a resource to assist learning in the classroom. This page along with a supporting YouTube video (go figure!) demonstrates how it is effective for the administration of learning to a different means for students to acquire learning. Although I have named three specific pages and resources that I found this week in my absence from blogging, there is an internet world bursting with endless amounts of resources to support teaching and learning. I am going to leave you now with a blog post by Ross, a fellow EDC3100 student at USQ who blogged about how education is being changed by technology. I found the TED video embedded in post to be quite valuable. Hoping my rant as well as my resources have become some value for you all! I am working on a really interesting blog piece as we speak (yes, two in one day maybe… I guess I really am taking control!!!!) I am very interested in the issues pertained within this next post so stayed tuned for it!!! We are exposed to Lev Vygotsky’s constructivist theory in the first year of our undergrad education degree. I was always drawn to Vygotski’s theories due to how much I thought it still held relevance in our classrooms today. I am a strong believer in peer-learning, one of which I think is very important to our teaching pedagogies as well as the learning through EDC3100. The University of Queensland has an amazing page dedicated to Constructivist theory and active learning pedagogies which can be found HERE. In saying this, I would like to post some of the views of my peers in EDC3100. After reading my fair share of blog pages, I have compiled a selected few below in which have helped me with my learning so far in education and ICTs. I follow these three blogs all for different reasons. Not only do I know a couple two of the bloggers personally and enjoy talking to them about ‘all things education’ on a regular basis, but I really value the knowledge and passion all three share within thier blogs making it almost impossible for educators (not just us pre-service teachers!) to not value their stances and opinions. One short but interesting post by Stephen got me thinking about how I will embed ICTs into my teaching this coming prac. You can find this post HERE. In this post, Stephen discusses three very important points in that he reflects on when embedding ICTs into his up and coming prac. These three points that include, Lesson planning is crucial when using ICTs, Introducing ICT alone will not change the process of how I teach or how they learn and Students are more sophisticated in their use of technology than teachers and can be fountains of knowledge. The underpinning of these points not only had Stephen reflect on his up and coming prac and the implementation of ICT but also challenges me as a reader to also develop my personal pedagogy and strategies when doing the same. I can conclude that my stance on ICTs and education is quite obvious in the way I teach already. Most of my lessons have at least one element of ICTs embedded at all times. I have not really thought about why I have also done this, I just have! I myself enjoy ICTs and find value in them within the classroom – especially when teaching the 21st century adolescent. I also feel that students are already required to know and to use ICTs in everyday life where they already have many skills (maybe even more than the classroom teacher, as expressed by Stephen). With this in mind, it would almost be seen as a disavantage if ICTs weren’t embedded and utilized by students. It is up to the modern 21st century teacher to integrate ICTs to the supposed ‘old hat’ pen and paper method (note: I said, integrate!). Although I am very pro ICT implementation it would also be a disadvantage to solely use just ICTs discrediting the importance also of pen and paper. I would love to hear what you think about any of the points above! How do you implement ICTs in the classroom? How do your students respond and do you think they hold value or are just a nuisance? I didn’t realise they taught Schema theory at Primary schools.. eek.. Why havent I heard about it before! I have made a list of topics from the past week and a half of learning that I would like to blog about. I won’t lie, its a pretty long list strangely enough for such a short period of time, however I narrowed it down to starting with the topic that I would tricky to understand initially, and that’s the term, ‘schema.’ Although the idea of schema sounded relatively straight forward, I was still finding it difficult to being able to explain the concept. I decided to do some research using my favourite platform, Pinterest. Now, I am more than aware that Pinterest is a web-based platform designed at getting inspiration from photos with links to where they have come from on the web, however I really like using Pinterest as a starting point for that very reason and to support my initial learning of something new. When I inserted the term ‘schema’ into Pinterest I was given hundreds of examples from other educators on ways in that they taught their students (more embarrassingly for me, they were primary school lessons!) when it came to schema. One picture that really caught my eye was from a blog by a teacher in the United States named Megan (picture is below!) You can visit Megan’s blog HERE. From the looks of the chart Megan has created, links were made with the idea of schema and possibly the English subject. I was able to get a better insight in the term schema at a basic level just from the chart. When researching and piecing together the meaning of schema, I was able to draw connections from what I previously learnt in class from Vicki Farwell my lecturer as, “Your hidden assumptions” with the idea that these connections can be made from new acquired knowledge such as from books, television, the world etc. You could possibly say that I used my own schema to acquire new knowledge on what schema is! Kind of ironic hey! So not only was I able to grasp an understanding on the term schema, but I unknowingly used my own schema to build upon my knowledge on the term… exhausting I know! An aspiring Music Education student.